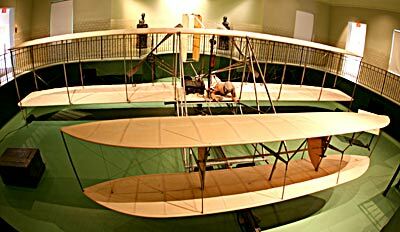 One of the highlights of the Carillon Historic Park is the Wright Brothers Aviation Center. This complex is on the eastern edge of the historical complex. The collections of the Wright Brothers Aviation Center tell the story of the Wright brothers’ lives and their historic achievement. The centerpiece is the 1905 Wright Flyer III, which is considered to be the world’s first practical airplane, restored under the close direction of Orville Wright and placed in Wright Hall when the park opened in 1950. When touring the center, you'll be greeted by a guide at the recreated bicycle shop (represents the 5th shop the Wright Brothers operated). The original bike shop was dismantled and moved from Dayton to Greenfield Village in Detroit. The shop was located at 1127 West Third Street and was the only building where the Wright brothers practiced all 3 of their careers: printing, bicycle sales and manufacturing, and aviation. The print shop was on the 2nd floor, the bicycle sales and manufacturing were on the first floor, and in the back was their machine shop where they developed their aircraft. The multimedia Object Theater dramatically displays some of the most significant artifacts associated with the Wright story, such as an original Van Cleve bicycle, one of the Wrights’ own designs. Visitors can also see the camera used to take the famous photograph of the first flight. The final part of the tour is viewing the original Wright Flyer III. 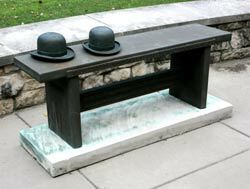 The Wright Flyer III was the world's first practical airplane. This flyer was provided by Orville Wright. 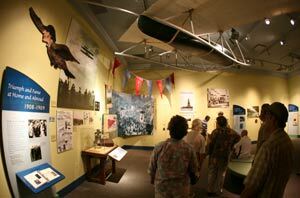 In fact, Orville assisted in the design of the Wright Brothers Aviation Center including the sunken display room where visitors get to view the flyer from an elevated walkway around the flyer. This elevated viewing position allows visitor to better understand how the airplane's controls operated. After viewing the flyer visitors are directed into another room where you'll learn more about the Wright brothers' world recognition as well as interesting information about Orville's later years.